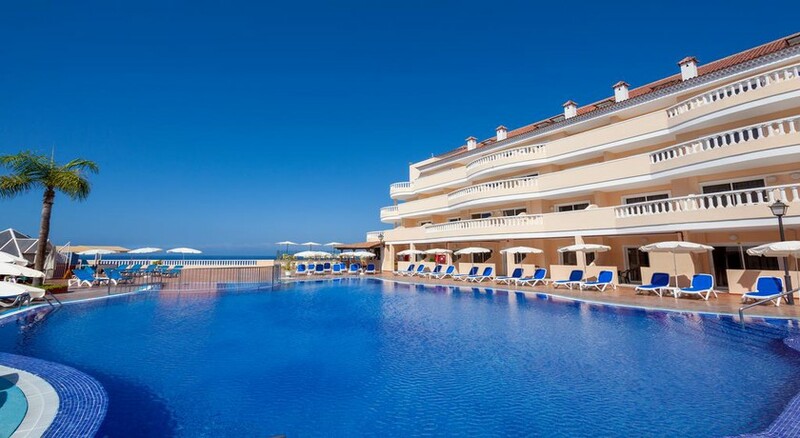 Minutes away from the beautiful black sands of Las Arenas beach, Hotel Bahia Flamingo sports a large outdoor pool and is a calmer alternative to the busier resorts of south Tenerife. Its evenings are lively, with entertaining shows, a mini disco and an exclusive club for kids that keeps them busy. Its spacious rooms come with attached balconies and terraces that overlook the sea and the spectacular La Gomera island. You can spend hours lazing on the sun-lounger by the pool or find a sunny spot on the sun terrace, where you can settle down with a book and a cocktail. From there, admire the rocky cliffs of Los Gigantes plunging deep into the ocean. Order a snack from the poolside bar if hunger pangs strike! The main restaurant serves sumptuous buffet breakfast, lunch and dinner, featuring local and international treats. If you’re feeling sporty, head over to the swimming pool or head to the tennis court to a set or two, or try your hand at table-tennis, billiards or head to the beach for some volleyball. At the beach, you can also get into the waters for some surfing or enjoy a catamaran ride. Alternatively, go on a whale watching excursion and watch the resplendent creatures swimming around you. 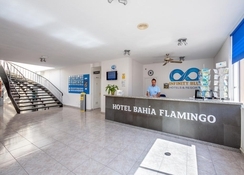 Located 2.3km from Los Gigantes, the Hotel Bahia Flamingo lie barely 400m from the black sandy beaches of Playa de la Arena, which means guests can hit the beach in less than five minutes from the property. Being located on the seafront promenade, the hotel is close to the commercial area dotted with shops, bars, cafés and restaurants. The Tenerife South Airport is 43km from the hotel. The hotel features bright and spacious double and family rooms, with balconies and terraces that provide a full or partial view of the sea. The guestrooms are categorised as: Standard Double and Family. While the double rooms can accommodate two to three guests, family rooms are suitable for four guests including children. Amenities that are common across all guest rooms are satellite television, telephone, en-suite bathroom with facilities, sofa bed, in-room safe (extra charge) and internet access (extra charge). 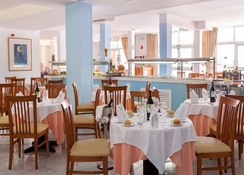 The main restaurant serves breakfast, lunch and dinner in buffet style, with the menu including local and international cuisines. There are also themed dinners on various days of the week. Settle down by the pool and enjoy snacks and martinis from the poolside bar or sip cocktails in the in-house bar. You can also explore the neighbouring areas for lots of bars and restaurants, where you can sample local dishes. Lounge by the outdoor pool under parasols or on the sun terrace, looking out at the picturesque neighbouring island of La Gomera. You can also head to the nearby Playa de la Arena beach, for water sports or a catamaran ride along the waters. Tee off in an 18-hole course at Golf Las Américas, about 24.9km. Kids get their own swimming pool and during vacations, a club ensures they’re entertained. Stunning place. The area is nice and quiet but only a 10 minute walk to the main town. Really friendly staff, great food and very very clean. Would recommend to all. Good hotel, food and entertainment very enjoyable - a nice walk to a Black Sand Beach right by the Atlantic. Amazing view also. Definitely a nice location for a break. My friend and I thoroughly enjoyed a weeks stay at the Bahia Flamingo mid September 2018 and have vowed to return in the near future. A warm welcome awaited us, our room, the building and grounds were clean and bright and all rooms enjoy a relaxing sea and pool view from a spacious balcony. There's a relaxed pace about the place ... (we deliberately avoided half term so there were few children splashing and squealing around) there were no reps or kiddies clubs .. or tours being forced on you .... a very relaxing breath of fresh air ... explore at your own pace. The weather was just under 30° every day... clear deep blue skies and azure clear sea contrasting against the striking black sand. Giant volcanic rocks and the Los Giantes mountains form an awesome sight on the horizon. We went half board and couldn't fault the buffet style breakfasts and evening meals, offering plenty of choice, from local fresh fish dishes and paella to casseroles salads pasta rice and chicken, vegetarian and vegans options were plentiful too. The resort has just enough bars, restaurants, souvenir shops and there's also a well stocked supermarket ... handy for snacks and cold drinks as there's a fridge in each room. The 'posh' white restaurants on the beach aren't any more expensive than the ones on the opposite side of the road so we chose to dine in style whether enjoying coffee and an ice cream under a shady parasol by day or dinner at sunset or under the twinkling stars ... I swear food tastes better when accompanied by a striking view and the sound and smell of the sea. Recommend a visit to nearby Los Gigantes .. a busy little hilly town of meandering streets and interesting little shops and a perfect secluded beach to unwind on after shopping. From the marina we took a 'pirate' boat trip to another nearby shore where we enjoyed food drink and music on board and were thrilled to see dolphins and whales playing together. Only downside was the hotel bar wasn't that enticing and the entertainment a little amateur. .. other than that couldn't fault it ! A very clean and well presented hotel. The staff are friendly and can't do enough to help. The accommodation was basic but adequate and thankfully had a fridge! The pool was spotlessly clean, with the staff putting away sun loungers at night, cleaning down the whole area every morning before putting out the sun loungers around the pool. The location is near the breath taking cliffs of Gigantes, with some fabulous beaches and mountain drives up the Teide national park. The only issue we had was the restaurant offering somewhat bland food on occasion, and would have been better to provide a wider choice for evening meal. The transfer on a bus from the airport takes far too long! Wish we had used a taxi! Had an amazing time at the hotel. The staff were so lovely and helpful when needed. Was such an amazing holiday! We had a he greatest time off our lives! The hotel staff were friendly and very welcoming we will definitely go again. A good 3 star hotel. It is kept very clean the staff are all friendly and helpful the restaurant offers the usual 3 star menu and is adequate. Very clean, good choice of food on all inclusive. Quiet resort, but good base for walking either direction to visit other beaches, resorts nearby.